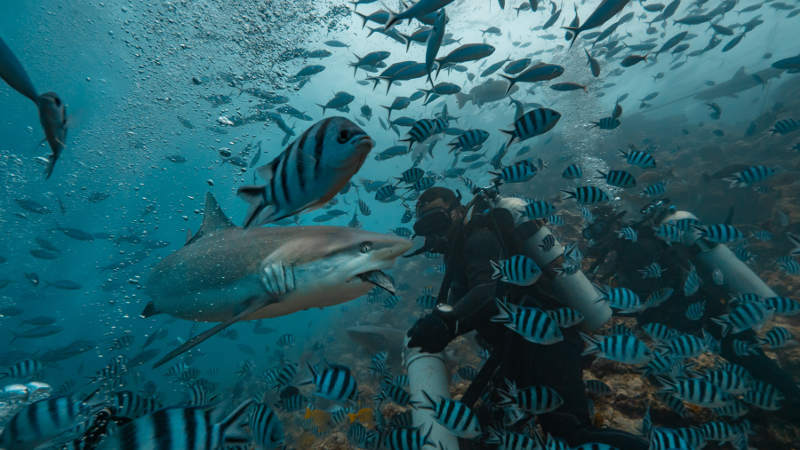 If on your next trip you want some adventure, the perfect combination of adrenaline and wonder you will find in these 22 places to dive with sharks. The marine world is magnificent and, underwater, these amazing animals will look more imposing than ever. But don’t panic! These areas have safe, guided diving; however, in some places you will need to be a certified diver to descend to depth. The sharks are a species of animal that fascinates and intrigues the world. Researchers, divers, scientists or journalists will always try to decipher the mysteries. The shark attacks that have raged in recent years near the coast of Reunion have only increased the attraction to these sharks. Check out the 22 of the best spots to dive with these huge sharks, be they white sharks, hammers, tigers or whales. Viti Levu is the largest and most populous island in the archipelago. On the south coast of the island, in the lagoon of Beqa, a warm blue sea protects in its depths a fauna and flora unique in the world. It has a 19 mile barrier reef and one of the highest concentrations of sharks in the region, including white-tip sharks, nurse sharks, gray sharks, lemongrass sharks, bulldog sharks , tiger sharks or hammerhead sharks. Introducing Brian Smith. A practicing Civil and Structural Engineer with 30 years’ experience. He is also an avid scuba diver with the same experience in recreational diving.